NECA-IBEW Electricians provide commercial, industrial and residential customers with world-class electrical contracting services from a highly trained, union Youngstown/Warren electrical workforce that helps ensure projects are completed in a timely and cost-effective manner — throughout Northeastern Ohio, Western Pennsylvania and beyond. 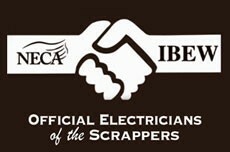 NECA-IBEW Electricians contractors are certified and qualified to provide you with the quality- and safety-first electrical installations you need, wherever you need them. Commercial jobs include service industry facilities, skyscrapers, office complexes, shopping centers, entertainment complexes and multi-building developments – each with specific electrical installation and maintenance requirements. Large-scale industrial interests and the construction of their facilities can involve factories and various production, automobile, power-generation, oil, gas, chemical, cement/aggregates and mining/minerals industries – each of which has specific electrical installation and maintenance requirements. Unifying safety, technology and cost-effectiveness in new home construction and remodeling projects requires particular, professional experience and knowledge to ensure safe and efficient electrical flow and the capabilities for future upgrades. Green energy installations help make your space sustainable with a minimal carbon footprint and include solar energy to power grids and integrating solar panels into the design of buildings for alternative energy options, as well as micro-inverters, designed for use in grid-connected solar power systems. Safely navigating every step of an electrical construction and installation project involves certified contractors ensuring code compliant installations and working across the board with other contractors. The installation of state-of-the-art communication systems, fiber-optic audio and video cabling, in accordance with EIA/TIA standards, requires having the systems in place that exceed market standards so you can count on the consistent, smooth operation of voice and data networks with no downtime. Managing all day-to-day repair, maintenance and response requests, big or small, requires professionals who manage all aspects of maintenance and repair projects, which is critical to preventing future failures. Proper safety and security systems meet specific needs for homes and or businesses, and include the creation and execution of custom safety plans. For Fire Alarms, these incorporate a state-licensed workforce to install hard-wired, multiplexed and addressable “smart” fire alarm systems to ensure they meet the requirements set forth by the National Fire Alarm Code (NFPA). For Security Systems, these incorporate determining the proper requirements for the positioning of raceways, wires, initiating and detection devices and video equipment, and the testing of all system components to confirm their proper operation. Advanced Direct Digital Controls (DDC), a building’s automation and multifaceted control system, can separately observe the building’s HVAC and security systems to streamline each independent function into one synchronized system for accurate facility operations. When power systems shut down, and immediate response is required to save you from detrimental downtime – and in order to prevent disasters and malfunctions in the first place, the most cost-effective and quality maintenance is required. Implementing power-generation needs so facilities are kept up and running at full power is accomplished through the proper installation of National Electric Code-compliant, on-site generator sets by experts who are versed in non-utility applications including peak shaving, emergency standby, cogeneration, industrial power and large-scale uninterruptible power. The installation, maintenance and testing of complex cabling, stress cones, transformers and high voltage equipment requires handling and directing large amounts of power; therefore, an aggressively developed, qualified workforce is required to meet a high-voltage project’s dynamic labor requirements. An extensive range of options designed to cover all lightning-protection needs is available to protect human life and valuable communications systems against lightning damage, which can destroy expensive and sensitive power equipment in seconds, paralyzing data/voice systems and severely limiting communication. Multiple factors are involved in the installation, energizing and maintenance of motor controls, including selecting and installing proper motor control equipment and ensuring controls function appropriately for the right motor and machine, preventing mechanical stresses under adverse conditions to ensure a smooth-running electric motor and its controls. Therefore, comprehensive plans are needed for positioning, connections, termination and ground-fault protection. Power disturbances and instability can occur because of outside sources, such as bad weather and power line failure, and inside sources, such as electrical equipment surges and malfunctions. These need to be minimized by assuring proper wiring, electrical grounding and proper power quality diagnostics, testing and monitoring to determine the best option for maintaining power supply. Satisfying power demands in an environment that is reliable, clean and highly efficient requires an understanding of market uncertainties created by deregulation, along with environmental concerns relating to the construction of new generation facilities. Therefore, more efficient means of delivering power and pursuing new solutions to energy-supply challenges are required through working with technology options, including conventional gasoline, diesel fuel, fuel cells, flywheels, natural gas, micro turbines and solar arrays. Utility companies need a reliable, professional and proficient workforce with the experience to safely handle complex, outside utility-line work in all kinds of weather and conditions, including electric line installations and maintenance; storm outages; and electric line clearance. A complete range of voice/data/video (VDV) service installations that can accommodate customized specs requires an expertise to ensure optimum efficiency and cost-effectiveness. Assessing, implementing and maintaining complex digital LAN, PBX and public telephone networks, and recognizing all media types and signaling technologies is essential in remaining on the innovation forefront of VDV.